I love this recipe! Straight out of the 1970's...it's so hilariously retro. 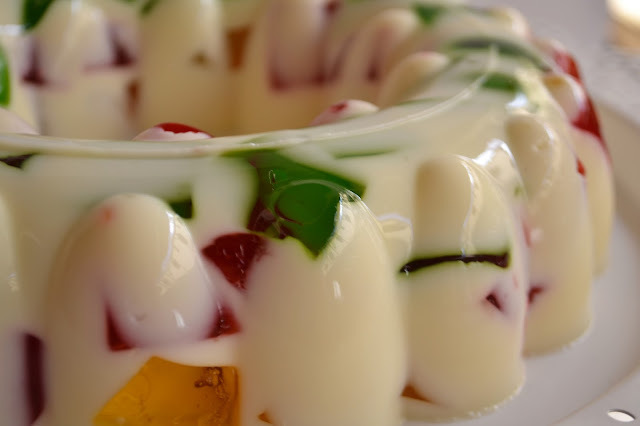 This is a Filipino dessert, usually served at Christmastime (hence the festive colours). 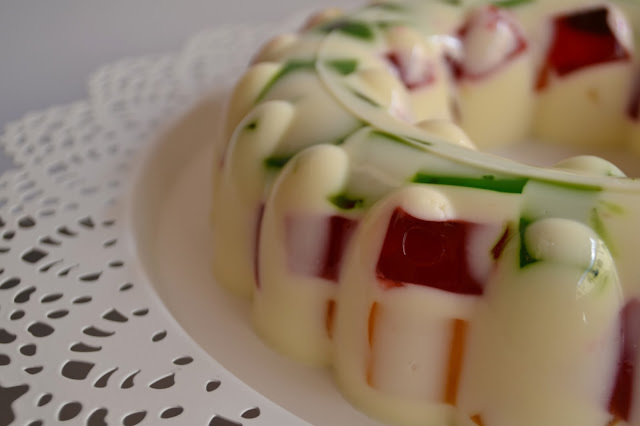 The adorable cubes of fruit jelly, suspended in sweet, pineapple flavoured cream jelly make for a very refreshing dessert. You can see where we get it's namesake from too. 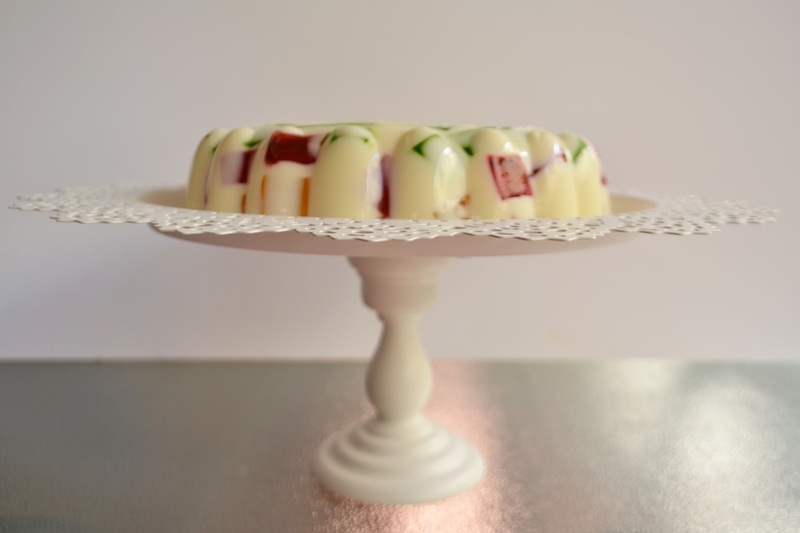 Don't let jelly's unfashionable reputation put you off; embrace the delicious irony and make this ridiculously easy dessert NOW! I used a recipe from Goldilocks BakeBook: Favourite Recipes from the Philippines' Best Loved Bakeshop, which my mom had brought back for me from her recent trip to the Philippines. Goldilocks is a Filipino institution; almost everybody there has a memory tied to a Goldilocks product, be it a whimsical birthday cake, a wedding cake or a 'just because' cake. I remember spending my 6th birthday in Manila with a mammoth Aladdin themed cake from Goldilocks that just charmed me to pieces. It was awesome! I used strawberry, lime and mango jellies but you can obviously use any flavours/colours you like. This recipe is stupid easy; if you can boil a kettle and stir, you can make this thing. Read on for the recipe! Makes 1 large jelly and 4 individual jellies (though this will depend on the size of your mould). Make up each box of jelly with 200ml boiling water and 100ml cool water and pour each flavour into a square container to a depth of about 2cm. 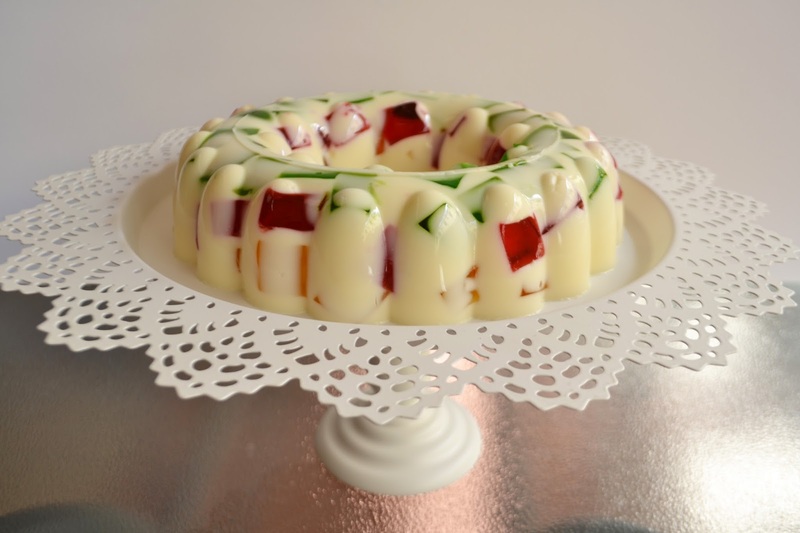 Allow to set then cut into cubes and arrange in your jelly mould. Mix together the unflavoured gelatin and the water and set aside for 10 minutes. Mix together the juice, condensed milk, cream, sugar and salt in a bowl. Add the boiling water to the gelatin mixture and make sure crystals are dissolved. Whisking all the while, add the gelatin mix to the cream mixture and allow to cool. Pour this mix over the fruit jelly cubes and give your mould a bit of a shake to make sure the mix is in all the nooks and crannies. Allow to set for at least 4 hours. Turn out on to a plate with a wing and a prayer then soak up all that retro glory! Enjoy! That's great! The best way to make sure your jelly comes out of it's mould perfectly is to dip the container in hot water for a 30 seconds to a minute then placing your serving plate over the top and flipping over. The hot water helps to break the seal between the jelly and the container. Just make sure you don't get any hot water on the jelly! Good luck!